I’ve spent the past few days watching a series of documentaries and mini-series, and it all has left me thinking about life’s big picture. The first series I watched was Niall Ferguson’s Civilization: Is The West History? Later I decided to watch Kenneth Clark’s Civilisation, and have just finished watching Michio Kaku’s BBC series Time. Watching all of these things got me in the mood to read some history, so I’ve taken a break from my normal cognitive psychology/physics studies, and thought about some other things for a while. When you stop and think about life on rather large scale, say the past few thousand years, and look at how people in our modern society act, it’s not only comical, but sad. They’re spoiled rotten and their expectations about what life should be and what they’re entitled to is completely out of proportion. Life for mankind for near all of human history has been, to use Thomas Hobbes words, “nasty, brutish, and short”. Their lives were filled with war, famine, starvation, disease, and every misery you can imagine. They lived in fear and complete ignorance as they roamed about through the forests and the fields, trying to scrape by a meal. They had to hunt using primitive equipment made from sticks and chipped stones, and frequently were badly injured during the process by the wild animals. When archeologists dig up their bones which are found in caves all around the world, you see how they were maimed and injured in every conceivable fashion – broken legs, missing fingers, disfigured rib cages, and so the list goes on. I can imagine a young man of around twenty-one years of age, out with his tribe hunting wild antelope, and as they’re surrounding one, the herd turns around and stampedes. He watches his best friend get trampled to death and he ends up being impaled through his arm by one of those long horns. He runs off in terror and crawls into that cave where he bleeds to death, his wife and small children wailing in tears. Their average life expectancy was under 30, if that says anything. Last night, after I was feeling pretty tired from studying and reading, I decided to watch a program called How TV Ruined Your Life, as it seemed to be pretty interesting. Though the presenter is far too pessimistic for my taste, I found it fascinating to watch him give a broad overview of the types of programs on TV today. I haven’t watched television in probably 15 years, and what little shows I watch is from the internet. I had no idea how bad normal cable television had become. I sat back in amazement thinking, “No way. There’s no way people watch this…” But they do! You can watch it yourself if you want. I absolutely loved the introduction to that show, so much so that I want to quote it. The question of human civilization goes something like this, “Life used to be so miserable and toilsome, but now human beings dominate the Earth and live relatively comfortably. How did this change take place?” What struck me was that so many things the television promotes and injects into our mind runs counter to the trends which have made great civilizations. I’ve known for a long time that television is pretty mindless, but I never considered it harmful and evil until I really started thinking about it. Just as Charlie Brooker said, television ruins our lives in so many ways. One episode of Brooker’s series focuses on fear, and how the television is always drumming up fear. When I heard that I immediately thought of a comment made by Kenneth Clark in his Civilisation series. He showed the prows of various Viking ships and how they were intended to instill terror and apprehension in all who saw them. They were marauders who floated up and down the rivers and sailed the oceans plundering and looting societies around them. He then compared that to the head of a famous Greek sculpture – Apollo of the Belvedere. Clark pointed out that a civilization requires hope and stability in order to progress to any great height. People must have firm ground beneath their feet in order to pursue long term goals and do great things. Anything which destroys that hope, stability and security is an evil against human progress. He talked about the Roman empire and showed their great aqueducts, which are still around even to this day, thousands of years later. Those things took forever to build but the people constructed them because they believed their society would be around for a long time. They built those for us and our children. To build things with future generations in mind, thousands of years from now, that’s just beautiful to me. What was also fascinating to me was that the barbarians tried to destroy those aqueducts but were too primitive to even know how take down such a massive structure. Niall Ferguson’s Civilization sets out to answer a question that he identifies as the “most interesting” facing historians of the modern era: “Why, beginning around 1500, did a few small polities on the western end of the Eurasian landmass come to dominate the rest of the world?” He wants to explain the origins behind western power. He identifies six core factors behind our civilization’s success: 1) Competition, 2) Science, 3) Private Property & Democracy, 4) Medicine, 5) Consumerism, and 6) Work Ethic. To summarize it as quickly as I can: 1) Competition: you have to have a constant flow of new ideas about every aspect of society, all competing with one another. People must be free to think about every aspect of their lives and how they want to live. Alternatives must be set in front of them and they must be free to choose how they wish to live. 2) Science: understanding the world is the main driver of progress because it allows human beings to flow with the world around them, mold it how they wish, and live in harmony with and dominate the forces around them. 3) A private property owning democracy: everyone must have some stake in the action and a say in how things are being run. Home ownership is the most important. Ferguson directs us to John Locke’s vision for Carolina, where near every citizen was a significant property owner and everyone had a vote — the American Dream. 4) Medicine: Diseases and plagues are always ravaging mankind so medicine must be a central focus, being continually improved and researched through science, and made readily available to all citizens so their lives aren’t wasted by an early death or some debilitating handicap. 5) Consumerism: this basically amounts to the free market determining, at least to a large extent, what that society produces. This allows people to enjoy the comforts and joys of their labor, and for factories to produce what people really want, not what a government bureaucrat thinks people want. It’s a form of freedom just as important as the vote. 6) Work ethic: the society must encourage and also reward people for their hard work. A solid work ethic must be placed into the hearts and minds of the people, with an unwavering belief that they can and will build a better world not only for themselves but for their posterity as well. When I watched Brooker’s program on television, I saw that the “idiot box” fills people’s minds with vacuous empty content, devoid of science and an understanding of the universe, and props up false expectations of what life should be. It puts us in competition with one another, but not the right type of competition. True economic competition is about trying to create new products and technologies, your best ideas against other people’s. Competition is like AMD vs Intel to make the best computer processing technology. Television promotes a sort of inane consumerism totally geared to emotion and ego. It focuses on making you the most beautiful, desired and revered person in the room, instead of being a truly valuable and knowledgeable human being. It’s empty. Today’s reality shows promote success and fortunes without doing anything for society. You’re famous for being famous. And when you look at the newspaper, who is being promoted and featured? Lindsay Lohan, big brother police state, mindless comical videos of cats, and other inane things, never promoting work ethic, science, freedom, history, economics, or any of the things which make a society successful. When we read the newspaper, why aren’t we focusing around architecture? Why don’t we feature scientific discoveries? Why don’t we feature medical breakthroughs? We don’t because we’re not civilized. Have you guys ever thought about the future of mankind, or even advanced alien species? We picture these great beings with huge heads filled with vast knowledge of the universe. We even speculate about such great beings in sci-fis like Star Trek, searching for great civilizations. Can you imagine finding such a species on a distant planet, with super technology, with the ability to manipulate their own genetics to make themselves into whatever they want to be, transporters to take them anywhere in the cosmos they wish to visit, the ability to turn raw energy to any form of matter they wish — and they’re sitting at their kitchen table reading celebrity gossip, psychological studies about why they feel empty and depressed, looking at ads for beauty cream for their face, all while entertaining shallow propaganda for why they should invade poorer, less technologically advanced nations, killing hundreds of thousands of their citizens. That is not civilization. Author JasonPosted on May 15, 2011 May 17, 2011 Leave a comment on Are We Civilized? I came up with this principle years ago, and I have yet to see it violated. I’ll supply a handful of examples to illustrate, though it probably doesn’t need to be explained all that much. If people aren’t aware of scientific advances and the importance of research currently underway, and they’re asked to make decisions regarding whether or not it should be funded, the ethical implications involved, and how we as a society should think about it, they’re going to make all the wrong decisions. If people aren’t knowledgeable as to how the universe works, such as biology, physics, chemistry, etc., they’re going to have worldviews that don’t line up to the evidence and which inhibit future progress. If people lack an understanding of the economy, the political issues we face, and the extent and scope of what’s facing us as a society, they will vote for the wrong politicians, and they will take stances terrible for everyone involved, themselves included. If people have to make a decision, and if by the time they are to make that decision, somehow, by some method, the proper knowledge hasn’t made its way into their head, things will go badly. I believe this to be a core law of the universe. It’s like entropy. The sheer probability is that things will end in a disordered chaotic state. That’s the natural flow of things in this world, and absent knowledge to correctly navigate the world’s treacherous waters, we’ll sink. The multitude of choices set before us at any given time is so vast, to correctly guess by chance alone which path will move us forward is about as likely as monkeys typing out a prize winning novel as they flail away randomly on the laptop keyboard left in their cage. What we so often focus on is getting people to listen and hear each other out. Is that a good thing? Of course it is, but that’s far from all there is. Yeah, it’s good that people listen to one another, and work together. But, and this is a BIIIIGGGGG but, you can cram a room of idiots together and they can come to a consensus, but that doesn’t mean it’s a good consensus. There’s one core principle behind all of this: actions have consequences. This universe of ours is lawful and orderly, even though it’s extremely difficult to figure out. Philosophers and great minds have always sought to give us some method, some simple universal principle which we can use to guide us in every decision we make. It doesn’t exist. A lot of people think, “Love one another as you love yourselves” will fix things, but without knowledge it’s not enough. In most cases, good intentions won’t take you very far at all. The common man thinks, “If we could just get a good honest man in office, he’d fix it. He’d end the corruption.” The problem is, if you’re not extremely knowledgeable and intelligent, you won’t even be able to identify corruption when you see it. 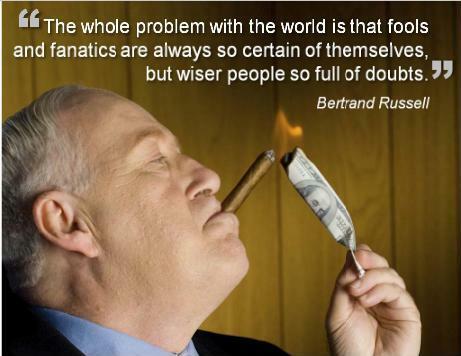 Bertrand Russell has a great quote, and it’s so good that I’ll add a picture with it as well! Fools are so certain of themselves. They think they understand everything. The wisdom of the wise leaves them timid and unsure of all life’s complexities, and unless they’ve spent many years in focused study on that particular area or issue, they’re not inclinded to have a strong opinion. But fools, they know it all. The first step is to get them to understand that they don’t understand. That is by far the hardest step of them all. The same foolishness which makes them feel certain of everything keeps their mind closed. This step is made even more difficult by the fact that they don’t even know the state of stupidity they’re in. These two steps can’t be skipped. There is no other solution to them. If our education establishments fail to accomplish this goal, they fail and our society suffers. Now of course, nobody can be an expert in everything. So what do we do? This is where you do the next best thing: you hold people to a method of thinking and quality of argument established by the scientific method, rooted in strong empirical evidence, historical observation, and peer review. We judge an “expert” by the quality of the arguments presented. But, even then, people can write up reports which sound scientific, they quote numbers, present all kinds of cause and effect relationships, have charts and other data to support each claim, and so on and so forth. What do we do now? There’s nothing we can do. Obviously the next step is for us as a society to let the expert make decisions in his or her special area. But which expert do we follow? How do we know an “expert” really knows what they’re talking about? We can’t. The only way you can know for sure is if you yourself are an expert too, but considering all there is for us to know in this world, that can’t happen. In the end, we just have to trust one of our experts. Why? Because there is no solution to a lack of knowledge. If you have to make a decision in some area, even if that decision is to let someone else make a decision, that person must have knowledge as to the consequences of their actions, and if that knowledge is not present in their head at the time they make that decision, or if they choose to do actions which benefit themselves and their buddies instead of you, that’s just how it is. We’re left with another bad decision. But even if this is as far as we’ve gotten, a group of critical thinking people is infinitely better than fools who feel they know it all and base their decisions on god knows what. Hopefully the knowledge we’ve picked up from the introductory level education courses will help us decide between the experts and filter out those who are obviously wrong. And, most of all, at least everyone’s minds will be open enough to have a quality discussion, and we can all make our case. Keep in mind though, all of this only brings us to the starting line. It doesn’t solve the problems at hand. Author JasonPosted on May 6, 2011 May 8, 2011 3 Comments on Why Do Humans Reason?